If you would start an Urban Farm, would you take advice from someone who made 25 of them happen? If the answer is yes, you’ve come to the right place. 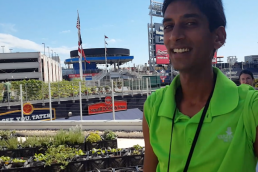 Meet Niraj Raj from Cultivate the city, one of the more inspiring people the Urban Farming Movement has to offer. Or is it better to say: “One of the people that make the Urban Farming Movement so inspiring“? This makes a network of educators, eager to work with gardens and farmers of all ages and experience levels. To make it all happen, they have a unique web of revenues. 25 Urban Farms. Let’s repeat that: 25 urban farms. I suggest you accept the mastery of Niraj Ray and follow his guidance on the 12 steps to become an urban or vertical farmer. Check the episode below!